It’s no secret that the real estate market slows down in the winter, but it definitely doesn’t stop. Buyers and sellers are active in every season, no matter the weather. 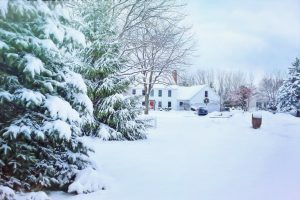 In fact, it may surprise you to know that winter is actually a great time for buyers to hit the market! If you’re ready to find your dream home, consider these six compelling reasons to buy a house in the winter. Winter is the slowest time of the year when it comes to real estate. Sure, there are fewer houses on the market but there are also fewer buyers, which means you face much less competition for any home you want. Buying in the winter means less stress and uncertainty because when you find that perfect house and make an offer, chances are you’ll get it. This lower competition also translates into lower prices for the buyer. Demand is down, homes will be competing with each other to sell, and you, the buyer, come out on top. The Atlantic couldn’t be more clear when they reported that “the cost of a home is higher in the summer than in the winter.” The absence of bidding wars in the winter means that houses will sell for their listing price or lower instead of getting artificially inflated by other buyers. Do you want to put 15 percent down instead of 20? Do you want the seller to cover the closing costs, or maybe knock a final 10k off the list price? All of this is possible when you buy in the winter because you have more negotiating power. Most people sell in the spring and summer because the weather is better and moving during this time works well with kids’ school schedules. When people are selling in the winter, it likely means something significant happened and they want to sell fast. This urgency works to your advantage, and you get more negotiating power and ultimately a better deal when you buy in the winter. Summer is the busiest time of year on the housing market and your real estate agent will be swamped helping multiple clients at a time. It can be harder to schedule one-on-one meetings and the buying process as a whole can take longer. In the winter, you may be the only client and the agent will be more motivated to help you close a deal. The process is likely to go smoothly from start to finish because everyone involved, from lenders to agents to lawyers and more, are in the midst of a low season. Another perk of buying a home in the winter is that you can see first hand how it handles the harsh temperatures and storms. Take notice of any sounds, temperatures, drafts, and more when you walk through the home. When you get an inspection, they will likely find any cracks or other issues exacerbated by the weather that the summer inspector might miss. This will help you go into the sale with a better understanding of the home’s condition and maintenance costs that may crop up in the future. Before you buy a house it’s important to get familiar with mortgage rates. This number is the percent of your loan that you pay each month. For example, if your rate is 4 percent, you’ll pay $400 per month for every $100,000 that you borrow. If it’s 5 percent, that number jumps to $500 per month for every $100,000. Even a 1 percent change can have a big impact on your finances, so it’s best to secure the lowest mortgage rate that you can. These change month to month so if they’re low in the winter, there’s no guarantee that they’ll stay down if you wait to buy in the spring. Sometimes, it’s better to buy fast to lock in the mortgage rate you want. Winter is upon us, but that doesn’t mean you need to press pause on your plans to move. When you buy in the winter, you face less competition for the house you want, get improved negotiating power, and will likely lock in a lower price when all is said and done. Additionally, you’ll benefit from more time and attention from your real estate agent and lender, you can inspect the house when it’s at its most vulnerable in the winter, and you may even be able to get a lower mortgage rate as well. If you’re ready to begin your winter house hunt, don’t wait. Call The Degnan Group to get started today!